We don’t know exactly when the APIs are to be released and officially announced, but we assume that it’s going to be soon, since someone had their hands on the finished blog post already. As we reported before, the Google+ team is taking a slow and very calculated approach to the release of its APIs. Not wanting any privacy disasters like it had with Buzz, the company is choosing to release read-only versions of APIs at first. No writable APIs have been made available for the service, yet. What does the API mean for app developers? It means that companies that develop apps that pull in photos from all different social networks and sites now have one of the biggest ones to pull from. For example, photo sharing app Batch will benefit greatly from being able to pull in photos from Google+. 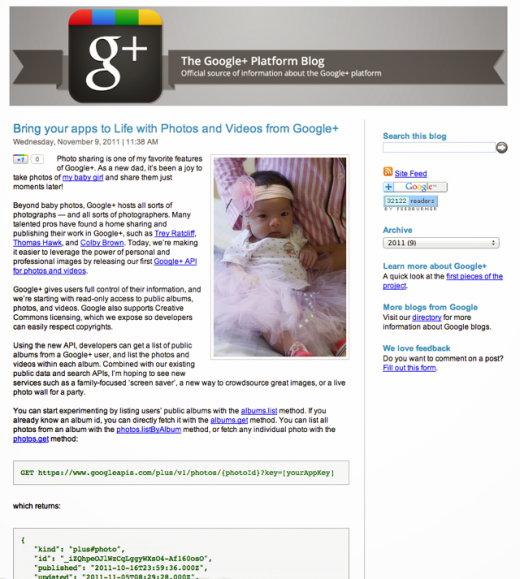 It also can help Google+ catch up with top photo sharing sites Facebook and Flickr. How long can the service turn down growth opportunities with having a read and writable API? Twitter saw incredible growth when third parties started building apps on top of its service.